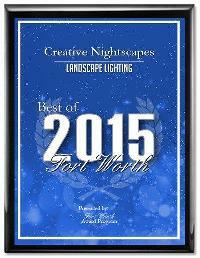 Creative Nightscapes, located in North Richland Hills, specializes in the design, installation, and service of LED outdoor lighting. 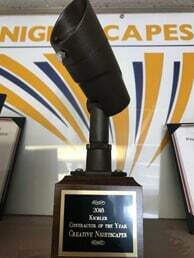 Kichler, the number one brand in outdoor lighting has recognized us with their top award, “Landscape Lighting Contractor of the Year for the United States and Canada,” four of the past six years. Serving the majority of the DFW metroplex area, we design, install and service all low voltage lighting systems, and specialize in LED lighting for outdoors. We offer the best warranties in the outdoor lighting business, maintain a total team of designers and installation crews who work for us. We do not use subcontractors. We maintain all of the systems we install. 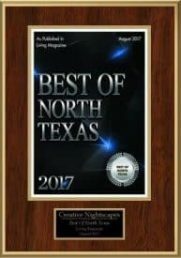 Creative Nightscapes is a member of the Association of Outdoor Lighting Professionals (AOLP) and the Better Business Bureau. 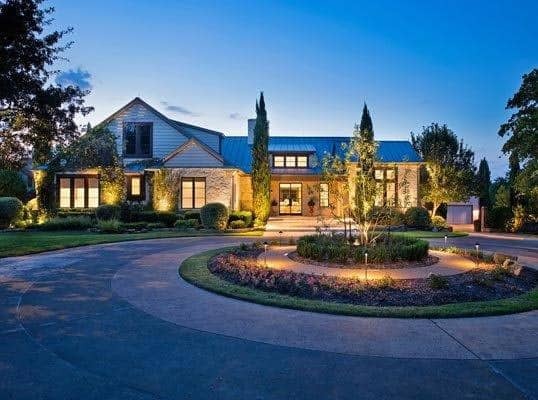 We got our start in 2004 out of owner Patrick Cheatham’s garage and in the subsequent 14 years have grown to 14 employees and have completed more than 4,300 lighting projects throughout the Dallas-Fort Worth Metroplex. Patrick graduated from the University of North Texas with a Bachelor of Science degree. “I love my landscape and home,” Patrick said when asked about why he got into the business. “I wanted to create something beautiful at my home and fell in love with the look outdoor lighting provides. As a company, we wanted to provide a professional company that homeowners could trust and rely on to do the right thing. Now, 14 years later and 4,300 homes and counting, I feel we have achieved that, and keep working hard every day to make sure we take care of our clients. Patrick has been married to his wife for 30 years. They have two children and two grandchildren and love to travel. Creative Nightscapes supports (SOS) Sower of Seeds ministries in their mission to provide, food, water, education and homes for children around the world. 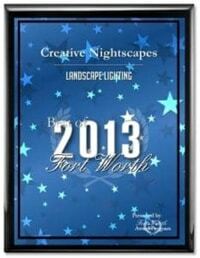 Creative Nightscapes has won Contractor of the Year three times from nationally ranked lighting organizations in the United States and Canada. 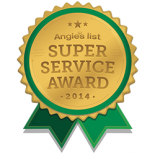 We have been awarded the Super Service award from Angie’s List many years in a row and have been recognized in several national publications for the landscape and lighting industry.